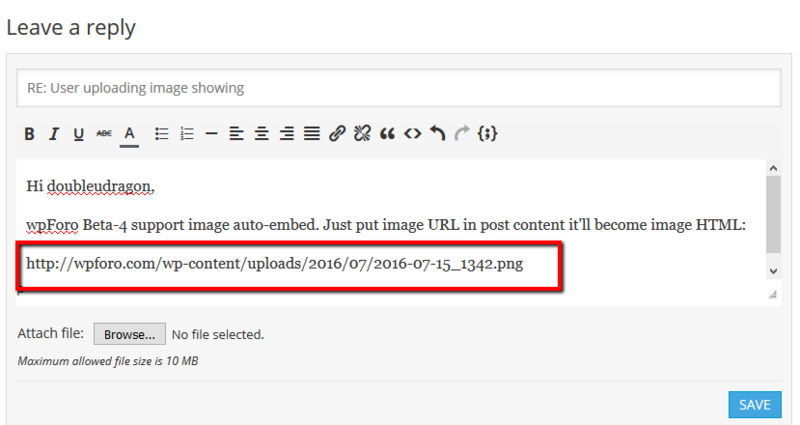 Below the Topic/Post editor, you will find a button [Browse] – Attach file. Click the [Browse] button and locate the file. Once you have selected a file. This file will automatically be uploaded and attached to this topic/post once topic is submitted. jpg, jpeg, jpe, gif, png, bmp, tiff, tif, ico, asf, asx, wmv, wmx, wm, avi, divx, flv, mov, qt, mpeg, mpg, mpe, mp4, m4v, ogv, webm, mkv, 3gp, 3gpp, 3g2, 3gp2, txt, asc, c, cc, h, srt, csv, tsv, ics, rtx, css, htm, html, vtt, dfxp, mp3, m4a, m4b, ra, ram, wav, ogg, oga, mid, midi, wma, wax, mka, rtf, js, pdf, class, tar, zip, gz, gzip, rar, 7z, xcf, doc, pot, pps, ppt, wri, xla, xls, xlt, xlw, mdb, mpp, docx, docm, dotx, dotm, xlsx, xlsm, xlsb, xltx, xltm, xlam, pptx, pptm, ppsx, ppsm, potx, potm, ppam, sldx, sldm, onetoc, onetoc2, onetmp, onepkg, oxps, xps, odt, odp, ods, odg, odc, odb, odf, wp, wpd, key, numbers, pages. To include an image that is not uploaded as an attachment and is located on another website, you can do so by copying the full URL to the image, (not the page on which the image is located), and either in post content. This will be automatically replaced to an image. Who can attach a file? Attach file button is only available for Usergroups who have “Can attach file” permissions in granted forum access (by default all except guests). Who can see attached files? Attached files are only available for view for Usergroups who have “Can view attached files” permissions in granted forum access (by default all usergroups). What happens when attached file is not allowed to view? All users whose Usergroups are not allowed to view attachments will not be able see attached files. When they click on attachment link, they’ll be notified with a message like “You are not permitted to view this attachment”. If you need an advanced features for your forum you should check wpForo Advanced Attachments addon. This addon allows to attach multiple files, images, videos, audio and all other file types you’ve allowed in settings. Files can be inserted inline, between post content texts. It opens a nice lightbox slider with many features to view and watch different type of attached files. This addon keeps user specific attachments in separate media library and allows users to use the same file on different topics and posts. You can limit file types, max uploaded file size and do a quick translation of front-end phrases using addon settings.